Kold War Scorpion is the work of MKOmmunity artist fear-sas, whose unique painted visions took the web by storm during Mortal Kombat X's development. See his original design artwork in a previous feature. 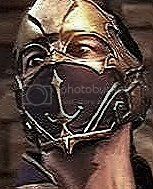 Other DLC bonuses include a Kollector's Edition Gold Scorpion designed by Coarse [full story], and the universal pre-order bonus: Goro. Future download skins include the Samurai Pack and 4 extra characters in The Kombat Pack. Fans can gain $5 toward the purchase of Mortal Kombat X when they trade-in any PS4 or Xbox One game while purchasing at GameStop. Visit GameStop for details. When bonuses are location limited, it's not a bad idea to play with high concept alternatives for iconic characters. Something seems to have been lost in translation in Kold War Scorpion, though. Even the artwork shown at the end of the trailer differs significantly from the mask-centric playable skin. Character-driven designs are preferred, but this undermines the concept. The seemingly permanently over lit mask is a bit of let down, as well. Mortal Kombat X officially arrives for the PlayStation 4, Xbox One & PC this coming Tuesday, April 14th! Register to share your thoughts on the MKX Forum, and submit & discuss fan kreations in the Fan Submission forum! As one who was praising the concept of Kold War Scorpion coming to life since it's announcement, I must admit myself that the skin in game is very lackluster. I'm pretty disappointed in it. <br/> <br/>Welp, I still like the picture, fear! As one who was praising the concept of Kold War Scorpion coming to life since it's announcement, I must admit myself that the skin in game is very lackluster. I'm pretty disappointed in it. Welp, I still like the picture, fear! I figured WB/NRS would put their own spin on the design. <br/> <br/>Shame. <br/> <br/>I really liked the fire fists. What else came with the Gamestop KE? Because this alone sure isn't worth it. <br/> <br/>I still like fear's artwork a LOT, but it's just a damn shame they twisted it so much. I figured WB/NRS would put their own spin on the design. I really liked the fire fists. What else came with the Gamestop KE? Because this alone sure isn't worth it. I still like fear's artwork a LOT, but it's just a damn shame they twisted it so much. Scorpion's cold war skin reminds me of character that would be from Hellboy. So boring. Probably I will buy the skin when released in some pack just to complete the collection. So has it been confirmed yet if this will be available outside the limited edition? Because I'm getting the Coarse edition, and clearly won't be getting it, but I'd still like it eventually. <br/> <br/>I presume it could be paid DLC later, but confirmation would make me breath a touch easier. So has it been confirmed yet if this will be available outside the limited edition? Because I'm getting the Coarse edition, and clearly won't be getting it, but I'd still like it eventually. I presume it could be paid DLC later, but confirmation would make me breath a touch easier. Yeah....looks pretty lame to me. 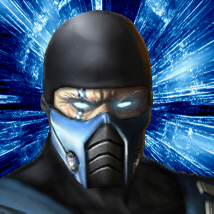 I have the code of Kold War Scorpion. I got it with the Special Edition. However it says on PSN that the code is not valid..... <br/>The box was sealed. I was the first one to open it, so there is no way that anyone else used it up before me. <br/>I also tried to restore my licenses in PS4 account settings but that also didn't work. <br/> <br/>Any suggestions? <br/> <br/>BTW I also got the code for Goro and it worked. The box was sealed. I was the first one to open it, so there is no way that anyone else used it up before me. I also tried to restore my licenses in PS4 account settings but that also didn't work. BTW I also got the code for Goro and it worked. The skin doesn't actually look as bad in-game. It's still disappointing though.